Abu Dhabi, UAE, 11 February 2019: Christine Lagarde, Managing Director of the International Monetary Fund (IMF), visited Abu Dhabi Future Energy Company (Masdar) yesterday to witness the progress of Abu Dhabi’s flagship sustainable urban community, Masdar City, and learn how investment in youth is helping the United Arab Emirates to deliver on the UN Sustainable Development Goals, Masdar announced in a Press communiqué. She also toured Khalifa University of Science and Technology’s Masdar City Campus, the communiqué said. Lagarde was briefed on Masdar’s role as a global renewable energy leader and as a pioneer for sustainable real estate, through its development of Masdar City, which is now home to thousands of residents and hundreds of businesses, the communiqué said. Masdar officials presented on the company’s diverse portfolio of renewable energy projects, as well as the city’s success in raising awareness of the commercial viability of low-carbon urban development, the communiqué further said. 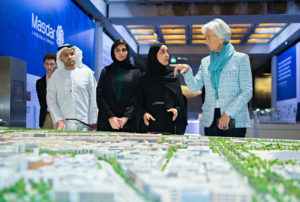 According to Masdar, Lagarde, who has led the IMF since 2011 and provides financial oversight for its 189 member countries, was briefed on this year’s Abu Dhabi Sustainability Week (ADSW) and how a number of its key initiatives, including the Zayed Sustainability Prize, WiSER, Youth 4 Sustainability and the Masdar Emerging Leaders Programme, are empowering youth to become active sustainability leaders. ADSW 2019 also hosted the inaugural Abu Dhabi Sustainable Finance Forum, at which 25 public and private sector organisations, including Masdar, committed to support the Abu Dhabi Sustainable Finance Declaration to jointly advocate sustainable finance and investment that fosters positive social, economic and environmental impacts, the communiqué said. The visit included presentations from three innovative start-up companies supported by The Catalyst, a joint venture between Masdar and multinational energy company BP, the communiqué said. Lagarde also met with young Emirati students and researchers of Khalifa University, who presented research projects on a range of topics, including renewable-powered hydrogen production plants and sustainable water desalination technologies, the communiqué further said. According to Masdar, Lagarde also participated in a roundtable discussion led by Dr Lamya Fawwaz, Executive Director for Brand and Strategic Initiatives, Masdar and Director of the Zayed Sustainability Prize.